KLUG-CONSERVATION produces durable paper and board qualities for the long-term conservation of both ancient assets and modern data carriers. Within nearly 130 years of intense collaboration with our customers we have gained the experience and know-how to produce object oriented items to exact dimensions and of premium quality such as protective boards and coverings for cultural assets and data carriers such as books, manuscripts, works of art, documents, paintings, maps, certificates and photographic material. We have very close cooperations with the paper industry, development and research institutes as well as paper conservation academies. Our company goals are focused on the continuous improvement of existing archival products and on the development of new ones. Starting from paper manufacturing, to the vast assortment of our durable and flat board qualities and the archival products such as NOMI®-Boxes, binders and folders produced from them, we can guarantee that our products are most suitable for long-term conservation and archival storage purposes. We consequently manufacture our board and paper qualities in accordance with strictly set conservation and preservation regulations, corresponding to the latest scientific research requirements on the paper industry. This enables us to fulfill and meet all known standards such as ISO 9706, ANSI Z.39.48-1992 and DIN 6738 LDK 12-80. 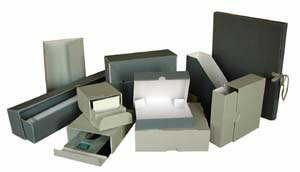 Our photographic archival products have successfully undergone the PAT-Test. The preservation of cultural heritage has been our company's philosophy and main objective since decades. Our flexible production capabilities enable us to manufacture not only suitable archival products for single unit orders but also for large serial production orders. There is practically no limit to the indefinite scope of KLUG products. We have no set standards, fixed or defined solutions. Your special requirement sets the dimension of our task. Save your cultural heritage for the future generation, not at any cost but with the most suitable and economical products. Conservation: professional, customized and without an expiry date.